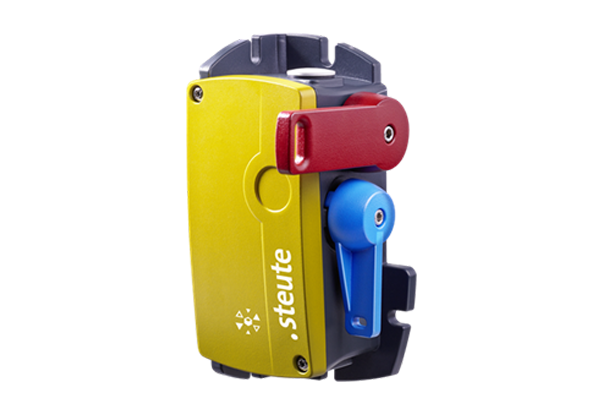 Steute has developed a completely new series of pull-cord switches with safety functions. The ZS 92 S series is specially designed for extreme environments. The cast aluminum housing is resistant to extreme situations, temperatures from -40 °C up to +85 °C and is equipped with multiple coatings (passivated, base coat, powder coating). The mounting dimensions are the same as those of the foreseller (the ZS 91) and other commercially available pull cord switches, making it easy to make adjustments to existing (transport) systems. Options of the ZS 92 S include an LED indicator lamp and the connection option to the safety-oriented "Dupline Safe" protocol via an integrated and plug-in safety bus module. The ZS 92 S pull cord switch is available in nine different settings and can be installed in any working position. Installation at the rear is also possible. The ZS 92 S can be used under unfavorable environmental conditions with cable lengths of up to 2 x 100 m. Soon a belt flap switch from the ZS 92 series will follow. Variants for explosive gas and dust atmospheres are in preparation. Read more about pull wire switches. During the design phase, the developers recalculated the complete cable system. This resulted in a considerably lower activation forces and stroke movements for the activation of the emergency stop function can be realized. This makes the pull cord switch easier to operate. This also complies with all relevant international standards (eg for emergency stop switches, emergency trigger switches and continuous transport safety). The flexibility of the switching device also played an important role in the development. The ZS 92 S can be supplied in nine different settings for the activation of the activation lever and the release. This means that the switch can be installed in virtually any working position, even at the back of an object.